On July 10, 1972, twelve pairs of tiny feet brought in the very first batch of students into the home of Flt. Lt. Vijay and Neena Williams. 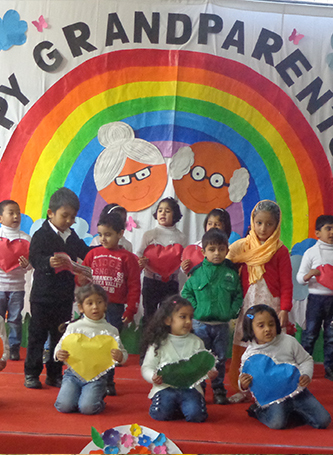 As they walked with tiny, apprehensive steps into the E-47 Anand Niketan address, their first day of formal education marked the birth of Mount Carmel School. The journey has taken the founders across the globe and the school into the lives of thousands of citizens. Today, Mount Carmel is recognized as one of the premier educational institutions in the country, dedicated to the cause of making a positive difference in the lives of our future leaders, striving to uphold and enhance integrity, discipline, hard work and a relentless pursuit of excellence. What makes a good school? Ask any admission-seeking parent today, and you will get answers ranging from name to fame to infrastructure and beyond. But really, what makes a good school? As you surf through the pages of our website, you will discover the ingredients that comprise the creation of a great school. You will recognize the importance of having a "vision", the requirement of hard-grit faith, the ability to persevere and the knowledge of a divine mission, mixed with the day-today grind of living and working in India, which alone can be a challenge on the best of days! So, how was Mount Carmel built and what role did the founders, Dr. Vijay Williams and Dr. (Mrs.) Neena Williams play? Answers to all these questions and a deeper appreciation of the goodness of God towards us, hopefully you will discover.